It is easily accessible with one of the largest motorable roads in the world - Khardung la (18,500 feet/5,600 m). After passing khardung la pass take a left turn from shyok river and then drive upto 23 km to reach the Dikshit monastery. The tallest statue of Lord Buddha (106 foot tall) stands right on the top behind Diskit monastery. Wake up early in the morning to take part in the prayer ceremony of Dikshita monastery. The tallest statue of Lord Buddha (106 foot tall) stands right on the top behind Diskit monastery, it took 6 years to complete and near about 30 millions of rupees spent in its construction. There is a huge collection of temples like Kangyu-lang, Tsangyu-lang, etc inside its complex . Then take a 7 km drive to visit the Hundar gompa. This is a small gompa belongsto the Gelug-pa sect. Drive down to the shyok river to reach here from dikshita gompa. 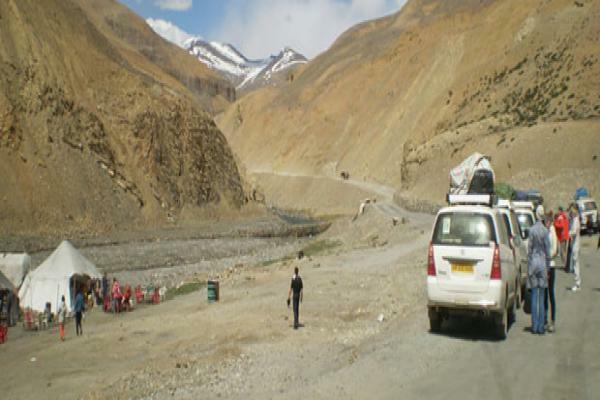 Retrace the route to the Ladakh Sarai via Khalsar and the Khardung La pass.